My bathroom makeover may possibly be the slowest in history. It started last year when I removed the hideous, cheap light bar above the vanity and replaced it with 2 beautiful light fixtures. The next step was to add moulding to the wall-mounted mirror, and I shared some tricks to make that process easier. And that's where things stayed... for months and months. Recently, I finally found the motivation and decided it was time to tackle updating the vanity. If you have lived in a house built in the last 25 years, the odds are pretty good you have lived with cabinets like these. Typical, builder-grade oak, finished in a gold/honey color. I had a decision to make. Was I going to paint or stain them? I have decided although its better than golden stain, I don't really care for the look of painted oak. You can still see the heavy grain, even after a couple coats. Also, I have yet to sell my husband on painted cabinets. So stain it is! 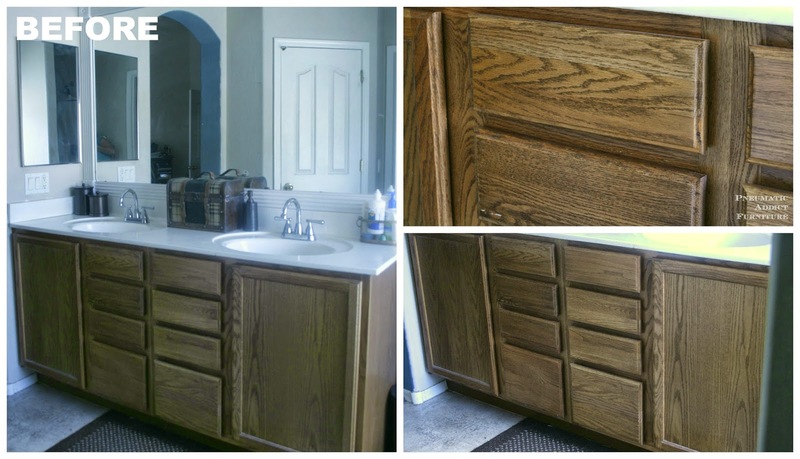 There was absolutely no way I was going to attempt to strip all the existing stain and finish off this vanity, plus I was looking to minimize some of the oak grain. I had the idea that I could use a tinted topcoat, like Minwax's Polyshades to darken the wood (same technique I used on my old kitchen table). Unfortunately, Polyshades is a bit of a drippy mess and can get thick and globby with multiple coats. I started researching and discovered that a lot of people have had great success darkening finished wood with gel stain. The first tutorial I read was this one. Just about every tutorial I read claimed you must use General Finish gel stain, and every single one of them used the color Java. I decided to be a rebel and try something else, and guess what? It worked! 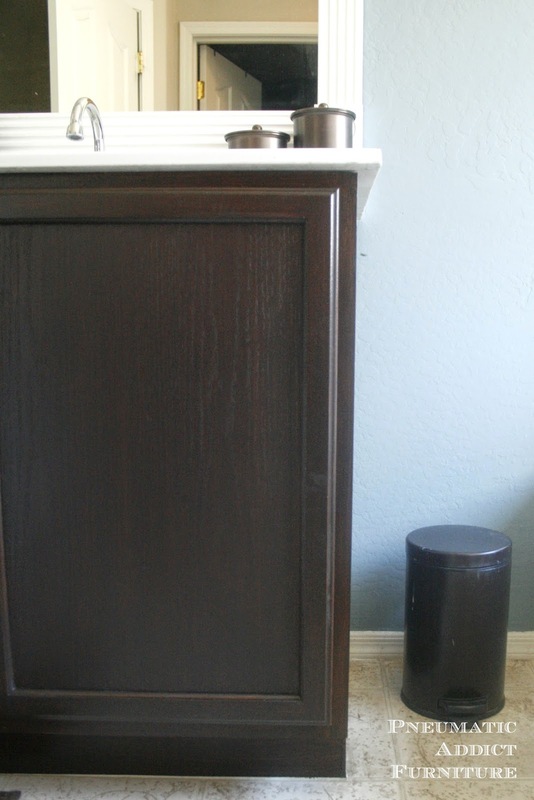 I used about half a quart of Varathane gel stain (by Rustoleum) in the color Dark Walnut . 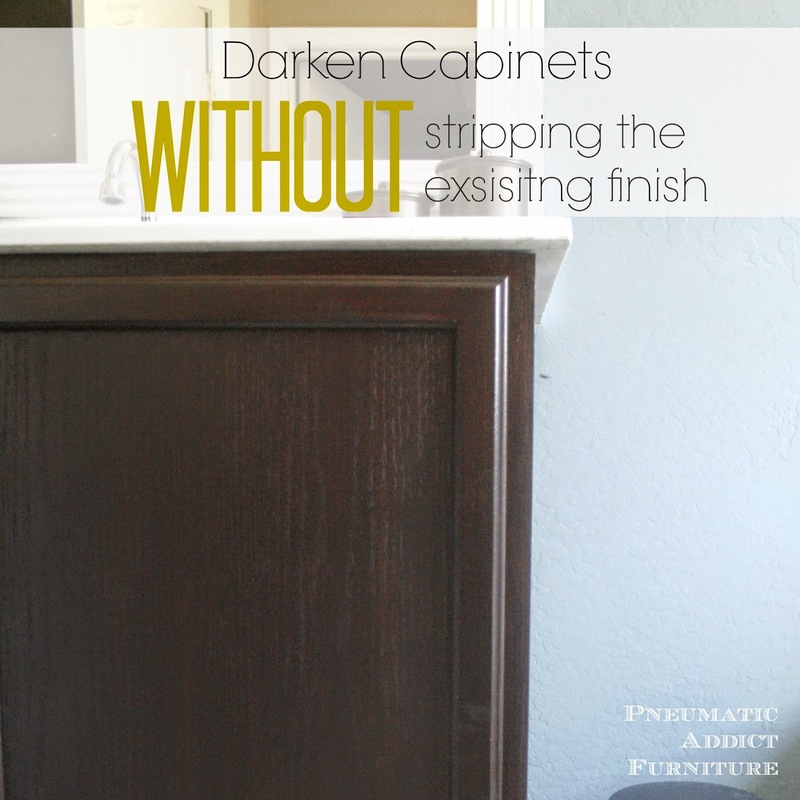 If you've decided to darken your cabinets, lets go over the steps I suggest you follow. First, remove the drawer faces and cabinet doors. I have seen people stain them in place, but don't do it. It takes like 5 minutes to unscrew the old doors. Lets do it the right way people. 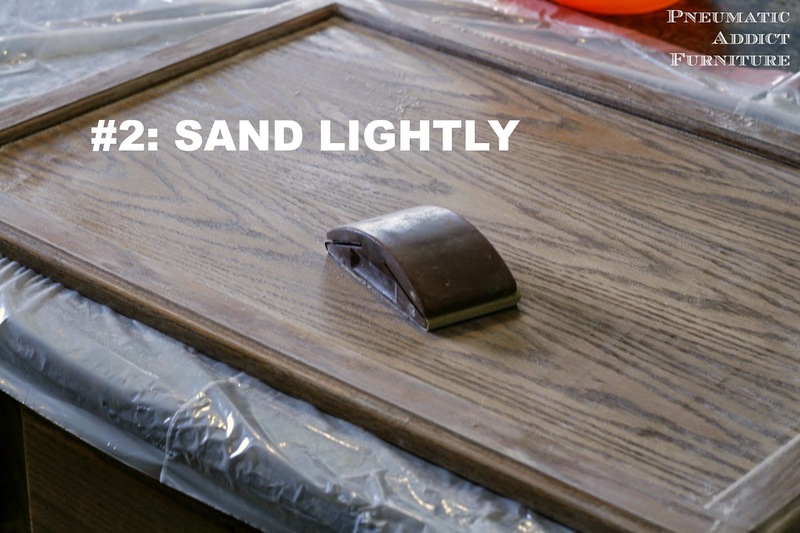 Next, give everything a light sand-down, especially if your cabinets are on the newer side. It shouldn't take very long. You arn't looking to remove the finish, just give it some "tooth". I used 150 grit. Make sure to use a damp rag or tack cloth to wipe them clean after. Once your wood is prepped, time to start staining. One mistake I see people do is to not stir their stain. Gel stain is super thick! Like pudding. 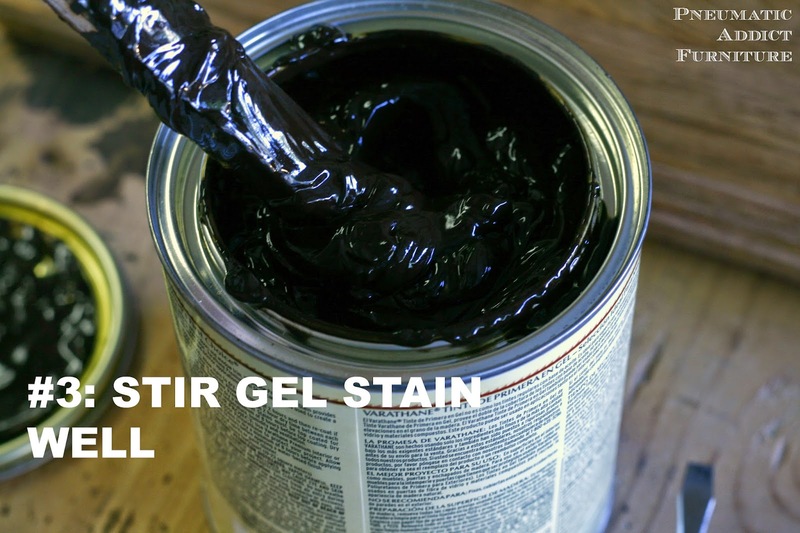 Although the pigment in gel stain doesn't separate as quickly as traditional stain, it is still a good idea to stir it well before use. As for application, I'll admit, I totally stole this idea. Once again, being a rebel, I tried applying the stain with a high quality brush but still had terrible brush strokes. I finally caved and went with the crowd and used a thick sock over a gloved hand. It really worked great to get a smooth, even application. For an authentic, stained wood look, make sure to wipe with the grain of the wood and be mindful of intersections. Keep the coats even but thin. Warning, the first coat will look like crap. At this point you will totally be second guessing yourself and possibly cursing my name. It will get better, I promise. VERY IMPORTANT! Let each coat dry for at least 12 hours. Seriously. I don't care if the can says you "can re-coat in 2 hours". Don't do it. Each coat gets better and better. It took me 3 coats till the color looked even and natural. If you want professional results, you are going to want to spray your sealant (I'll explain more in a minute). 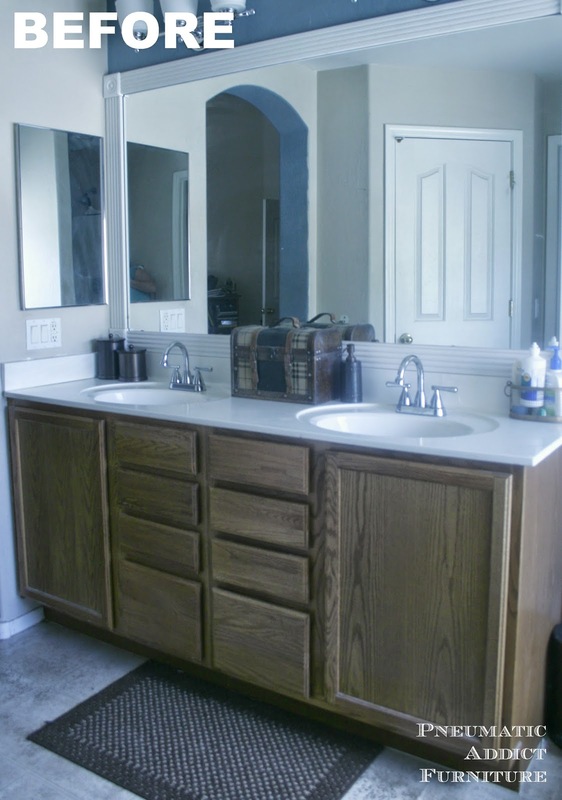 Take the doors to the (open) garage to spray, but the vanity will have to get sprayed in place. Yes, you can spray inside your house. Actually, that's how the pro's do it. You can pick up plastic drop cloths at Home Depot for dirt cheap. Cover anything you don't want sprayed and make sure to have as much ventilation as possible! If you read other tutorials, they will all tell you to use a water-based, wipe on top coat. Here's my thoughts: This is a bathroom. These cabinets will be frequently exposed to water. Water-based sealants aren't durable to long term water exposure. Once I decided to refinish my cabinets, I decided to make them look and feel as professional as possible. I started watching dozens of YouTube videos and reading on cabinet maker forums. One thing was universal. 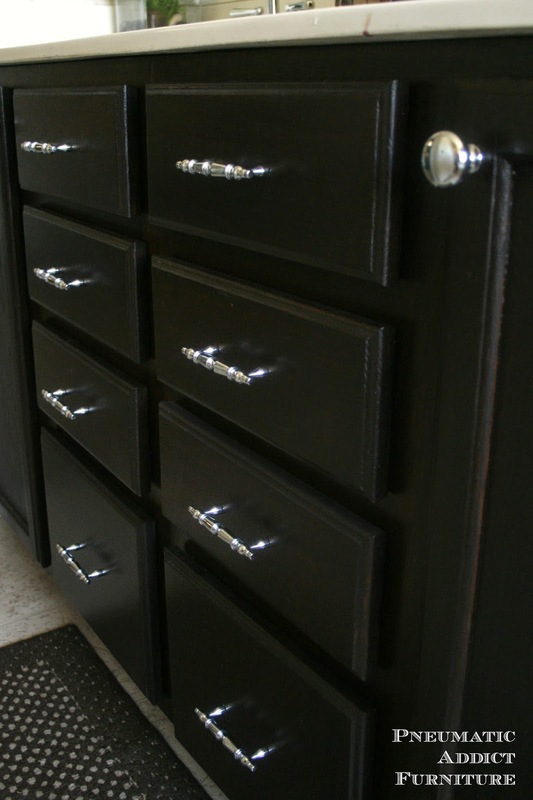 Professionals use lacquer to seal cabinets for a variety of reasons. #1- Its dries fast! You can re-coat, without sanding, in 30 minutes. #2- It dries hard as a rock, unlike poly products which are essentially flexible plastic. And #3- It is VERY durable. Once fulled cured, a lacquered surface should withstand years of heavy use. I know, DIYers are usually scared of lacquer. 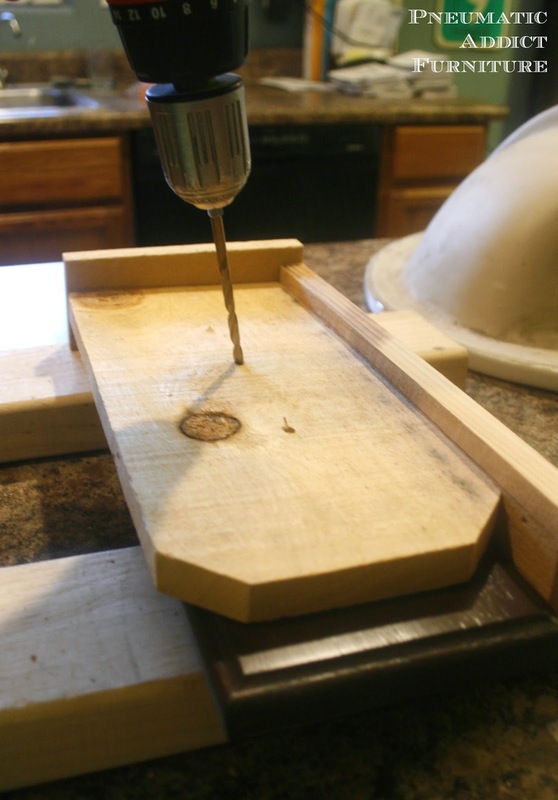 If you are attaching new hardware, make your life easier and build a jig from some scrap wood. It takes only a couple minutes to put together and ensures each hole is drilled in the exact same spot on every door. If you don't feel like putting a jig together, you can buy a plastic guide here . The last steps are to attach the hardware and drawer faces, and hang the doors. Let's take one more look at the "before". A few of the photos make it look darker than it really is. This shot shows the true color the best. A dark, rich brown. I am in LOVE with the hardware, generously donated by D. Lawless Hardware! 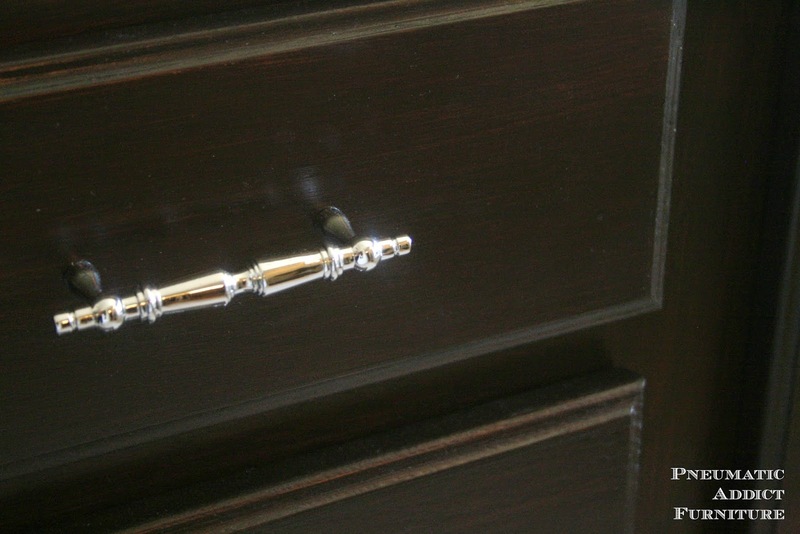 If you are looking for cabinet hardware, you have got to check them out. I honestly would order from them even if we didn't have a relationship. Honestly, the best prices and best customer service! 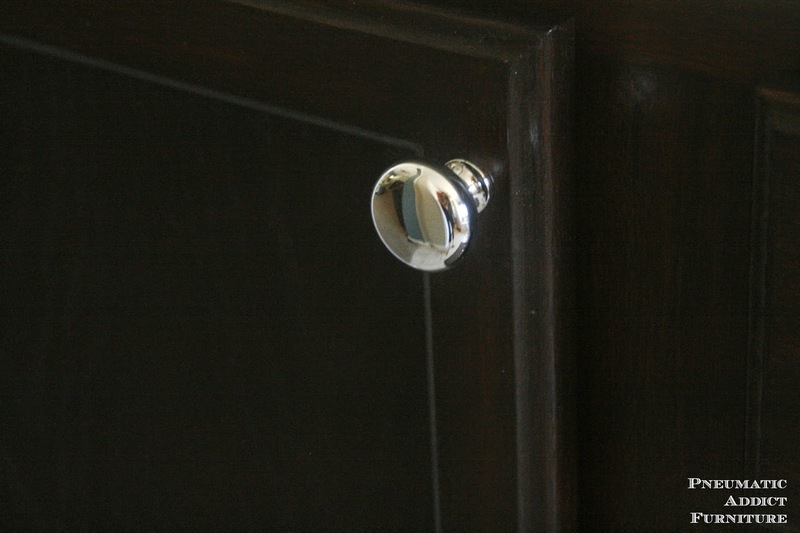 And the knobs are the 1 1/4" Polished Chrome Knobs. I know I'm bragging, but they really do look professionally refinished in person. Its not done yet though. I've got something special to put on top of it curing in my garage as we speak. I'll share it as soon as it's done! What do you think? Big improvement huh? 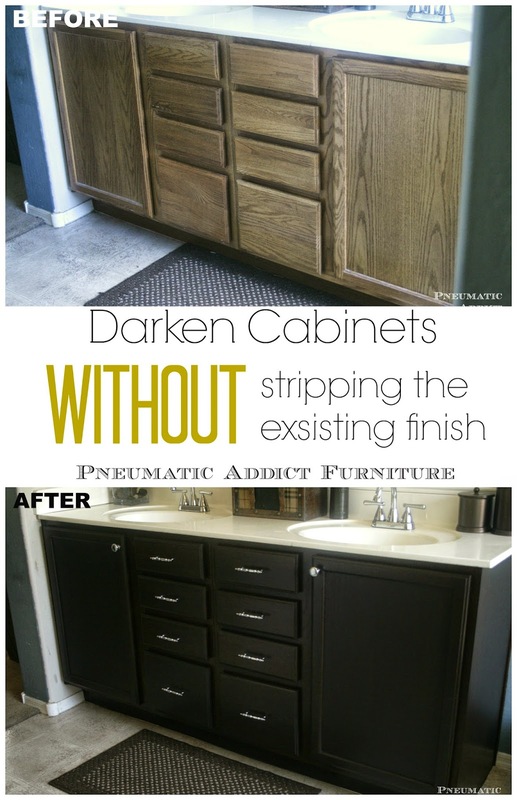 Your cabinets look AMAZING!! I love them and this was a super great tutorial too, I am pinning because you sold me on this technique, I have to try it someday!! Great tutorial! I have seen some of the other tutorials out there as well using the gel products, but have been nervous to try them so far. I'm wondering if I could use them on some outdated dining room chairs I have... thanks for the idea! Wow. I'm really impressed with your finish. It looks like a new cabinet. Thanks for sharing all of your products used and the reasons why you used them. Your bathroom looks beautiful. Thanks for sharing. You just saved me some serious future stress and work time. 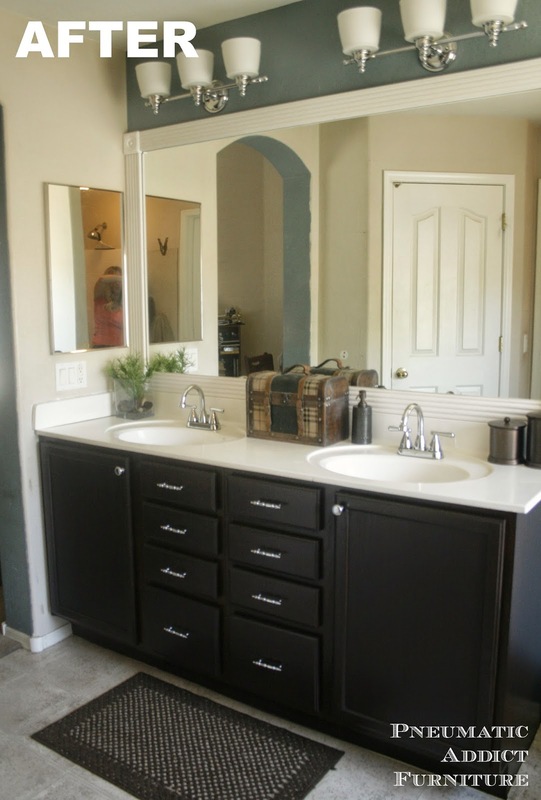 I plan to do this to my master bath. I love how it turned out, gorgeous!!! Thanks for sharing at Redouxinteriors. Your cabinet looks absolutely gorgeous! Thanks for all of the tips and take heart, yours is not the slowest bathroom makeover in history...4 years and counting, lol. Your cabinets looks so pretty now. 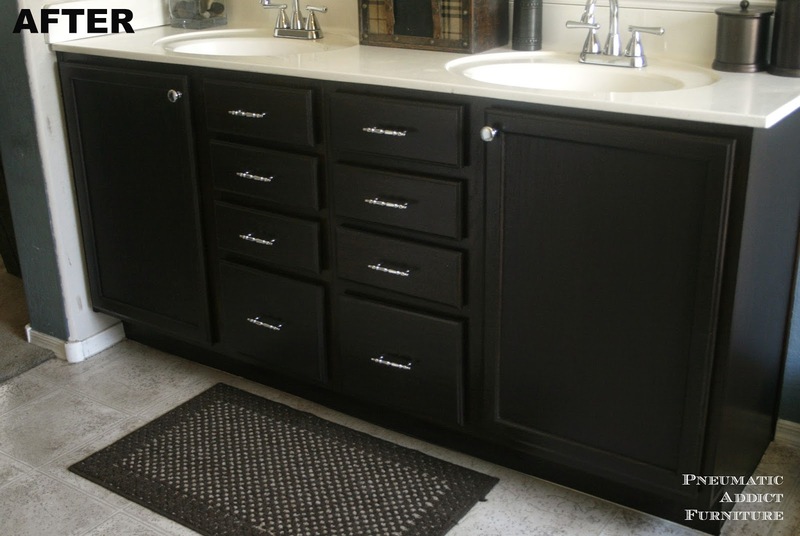 I love the dark stain with your silver drawer pulls too! Love this tutorial and shared on my FB page today. Well done! Thanks for much Jeanette! I'll stop by and check it out. Do you know if builder grade oak is usually poly urethane finished? Awesome. This is what home improvement can do to a person. He/She becomes creative in her own way. Well, after about 6 or 7 coats I have the color to where I want it. I just sprayed it with the finish and I have some bubbling or snake skinning in places. Do you know what's wrong? Ace hardware says the stain and the lacquer are not compatible? I'm having some bubbling on the finish. Ace hardware says the stain and finish are not comparable? Do you know what's going on? My finish seems to be bubbling, do you have suggestions as to why? Ace hardware says the stain and finish are not compatible? Cabinet is beautiful. Can you tell me if you lightly sanded between coats of stain? I'd like to suggest another method for darkening oak; have used it on furniture, never on cabinets, though it should work. Art supply stores sell a transparent spray paint made by Montana. There's another maker as well, can't remember the name. Montana spray paint is the best there is, and no, I don't work for them. I had a golden oak table (almost an orange looking color) that I wanted to be a dark, blackish brown. Fumed oak furniture from the early 20th century has this look. I washed it down with deglosser, let it dry, then applied Montana transparent black over it. Because the paint is transparent, the color beneath it still showed through, and it changed. Black and orange make: brown! The table is now a pretty dark brown, the grain still shows (the spray paint comes out as a very fine mist, easy to work with), and a coating of spray poly added to the effect. At $7-$10 per can, it might be an expensive way to change cabinet doors, but for light oak frames, small furniture items, etc., a good way. 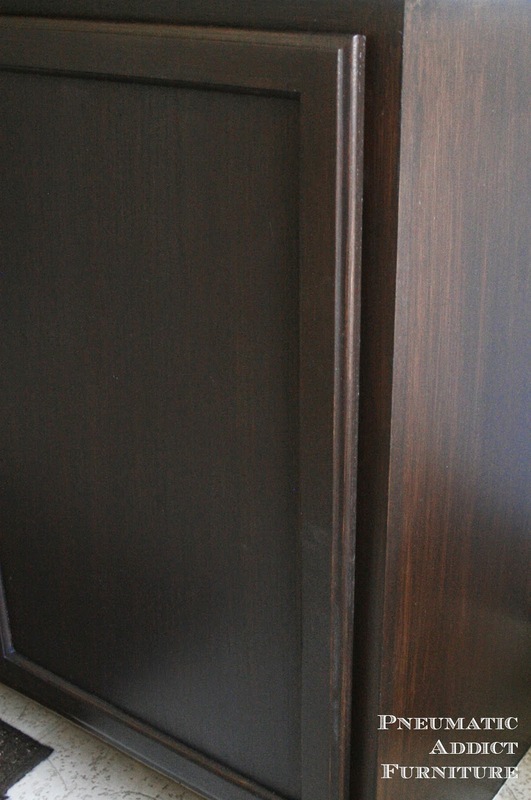 The side of my cabinets are a veneer (not wood) how would you suggest I treat them to match?